A Formerly Depressed, Self Conscious, 75 Year Old Woman Who Almost Gave Up On Life… But Now Has The Confidence, Smile, And Man Of Her Dreams! When they first met, they seemed to have everything in common. They were like a couple of teenagers again. Holding hands, going dancing, and watching movies together. Everyone in the community teased them because they were the “two biggest flirts” anyone had ever seen. Janet explained how she was embarrassed and frustrated with her partial dentures. She was so sick of getting food or chewing gum stuck under them. The other thing she asked about was whether or not she could have her teeth resemble a “Hollywood White Smile” like the people on the television show “Extreme Makeover”. I told her “of course” she could. We laid out an entire strategy for getting her the smile she wanted, while eliminating the ill-fitting, frustrating denture problem she was facing. After coming in for ONE visit, Janet took her new found youth to a whole new level. Gary said, “I loved her the way she was, but this makes her even more beautiful”! Janet’s new smile made her confident about her appearance, attitude, and life. She feels more comfortable and confident when in social situations. She is more assured about how she looks. Janet is a perfect example of how chronological age doesn’t have to affect how you feel about yourself. Just because you’re 55, 65, 80, or older doesn’t mean you have to look and feel like it. In fact, it’s just the opposite. What used to be old is now mid life. We don’t know how old we are going to live, but we can control more than ever before how we look, feel, and live! How Happy Are You With Your SMILE? ◊ Do you lack confidence when you smile? ◊ Are you unhappy with the overall appearance of your teeth? ◊ Are your teeth discolored or not as white as you would like? ◊ Do you have teeth that are too large or too small? ◊ Do you have any missing teeth, chipped teeth, or large gaps between your teeth? 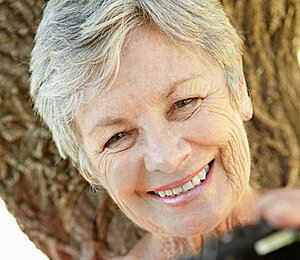 ◊ Do you have dentures that are unattractive, uncomfortable or loose? ◊ When you see someone with a gorgeous smile does it make you envious? ◊ Are you ever embarrassed to “smile wide”? ◊ Do you avoid going to the dentist due to the condition of your teeth? ◊ Is there anything you would do to change your smile today? If you answered YES to more than ONE of these questions you are a great candidate for a “Million Dollar Smile” consultation!